Welcome to our Sunday clinic! Our goal at CAC is to provide high-quality acupuncture treatments at an affordable price. By doing this, we hope to separate the issues of money and treatment and make it possible for you to come in as often as you need in order to feel better and stay healthy. Held in a comfortable, one-room environment, recipients of acupuncture in our community-style clinic are able to get the same quality of care and time to relax during treatment as in a private setting — without the higher cost. The difference is that, while the room is generally quiet and meditative, low conversations can sometimes be heard between patients and practitioner. This is because there are no physical partitions between treatment stations. Also, because all patients receive treatment without disrobing, wearing loose and comfortable clothing is recommended. Even in our shared space, be assured that we do our best to protect patients’ privacy and modesty. 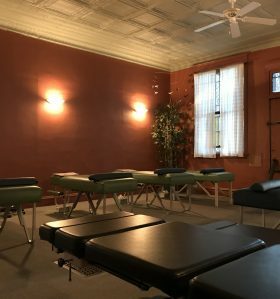 If you prefer a private session, you can explore that possibility by visiting Maria’s website directly at, Andersonville Acupuncture Studio. To register as a new patient, please click below, then select ”Create a New Account”, follow the registration instructions, and then log in to make an appointment. If you are an existing patient, just click below to make your appointment.